The St. Mary’s University School of Law honored the success and contributions of Chief Judge Emeritus David Alan Ezra (B.B.A. ’69, J.D. 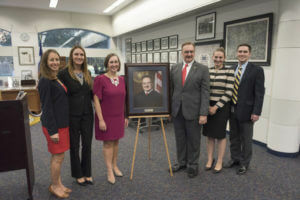 ’72) with a portrait unveiling this month in the Sarita Kenedy East Law Library’s Law Alumni Room. Ezra is the former chief judge of the United States District Court for the District of Hawaii, and is a longtime member of the Judicial Conference of the United States. He is the youngest federal judge appointed in Hawaii and has been designated by the chief justice of the United States for special permanent assignment to the Western District of Texas to assist with the high caseload. Among many notable achievements, Ezra was awarded the St. Mary’s University School of Law Rosewood Gavel Award in 2007 and the St. Mary’s University School of Law Lifetime Achievement Award in 2013. Ezra also teaches, participates in and frequently serves students and faculty of St. Mary’s as an adviser and judge at moot court competitions and other programs.